Rome gallery-guides.com - Rome, Italy art galleries guide Rome Borghese Art Gallery, Casino information about open hours, admission charges, paintings, sculptures, collection of art works, picture gallery, Italian artists including Raphael, Bottecelli and Pinturicchio, location and address, tel / telephone number, and general information about Borghese Art Gallery in Rome (Roma) area, Italy (Italia) IT - Last updated 30/10/2012. The Borghese Gallery (Casino Borghese) is widely considered to be one of Rome's most beautiful museums and the Borghese Gallery (Casino Borghese) has been sympathetically restored and renovated, with impressive attention to detail. 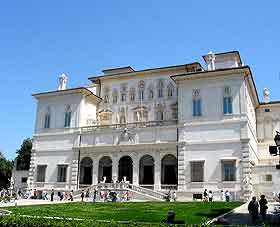 Building of Rome's Borghese Gallery (Casino Borghese) started in 1613 and it was intended to be both an imposing venue for summer parties and also a home for Cardinal Scipione Borghese's vast collection of art works. A number of the gallery's original paintings and sculptures were later swapped for a property in the north of Italy and these pieces are now exhibited at the Musée Louvre in Paris. Over the years, the gaps in the collection at Rome's Borghese Gallery (Casino Borghese) have been filled and the picture gallery on the first floor contains paintings by world-famous artists Raphael, Bottecelli and Pinturicchio.